Housing: To buy or not to buy? It might seem like the private housing market is only for those who can’t do better, but it has its place, and is not all bad. You’re probably more likely to get a garden: a bonus, particularly for Londoners for whom balconies and window boxes are often their most realistic hope. A private flat is also a great stop-gap for some, especially if utility bills are included in the rent. This perk offers a real opportunity to save some money, and if the place is fully-furnished, you’re laughing! Moving on, when it’s time, is much easier, so it’s perfect for travellers, business people, or even fugitives – those looking for a type of accommodation to which they don’t have to commit. It’s also true that if you’re a tenant with gumption, there’s scope to sublet the property that you, yourself are renting. You might decide to shack up with a partner, or manage to get a footing on the property ladder, and not return your flat or house to the council. Like a private landlord, you could charge substantially, pay the council its cheap rent, and make huge savings for yourself. If you’re caught, however, you will pay dearly, perhaps even with your freedom. Your choice! As misguided as it might be, that kind of entrepreneurship brings us nicely onto the option of buying your own home. There was a time when this was only viable for the most affluent amongst us. And, indeed, it can still be perceived as a symbol of potential wealth, if not actual. With more people stepping onto the property ladder, the bricks that once fortified the barriers between social classes are beginning to crumble as more decide to go for gold. The housing boom of the 80s and earlier 90s, led to soaring prices and today’s buoyant property market: the most lucrative that <?xml:namespace prefix = st1 ns = "urn:schemas-microsoft-com:office:smarttags" />Britain has ever seen. Everyone wants a piece of it! In principle, buying a house seems like a passport to personal freedom. 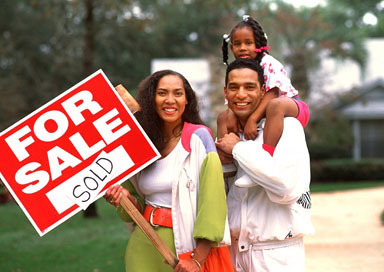 You go out to a location of your choice, find a home of your choice, and buy it. You can eradicate the noisy neighbour, and the pain upstairs that keeps letting the bath overflow and flooding you. Forget fish! You can have a dog, six cats, or a monkey. You’ll leave behind the balcony or window box for that south-facing garden, and take your dream kitchen straight out of the brochure, without consultation. You can even sublet a room, or the whole house, and make yourself a lot of extra money. Your credit rating will go through the roof, and you’ll achieve a sense of security yet unknown. You’ll know what you’re working for, so arduous though it may be, your daily hours on the treadmill will begin to make more sense. You’ll have something to borrow on, and something to leave your children when you’re no longer here. This is an investment that grows in value as you sleep in your bed, and the more home improvements you undertake, the more your home will be worth. So this time, replacing the grotty kitchen will actually add money to your home. And if you’re fortunate enough to buy more than one home, you can literally use rents as your income, without doing a day’s work. Let’s not bother to go into the prospects if you sell one of your properties! This sounds like a dream. And indeed, it is, and for many it will remain just that, as the price for fulfilling it is very, very costly! Unless you can find one yourself, your first payment will probably be to a broker who can ensure you have a lender. The lender will then want to know what deposit you can offer. But before you boast about your life savings, remember to take some out for the estate agent, your solicitors and the Stamp Duty. Leaseholds tend to be cheaper than freeholds, but make sure you can afford to pay service charges on top of your monthly mortgage repayments. Plus, charges for communal improvements can drop like a bomb when you’re least prepared. Also make sure you’re ready to fork out for the leaking roof, or that boiler, whenever it feels like resting again. On top of your contents insurance, you’ll have to pay buildings insurance, and gain planning permission for some of those big ideas you dreamt up as a mere tenant. Getting on that property ladder is no easy feat, and many of us are priced out before we even start considering buying as an option. In any capitalist society, where wealth only has meaning if there is poverty, we have to wonder if the government is only feigning compassion as it flaunts its incentive schemes: equity loans, for key workers (teachers, nurses, etc. ), shared ownership and the right-to-buy. Key workers have got to repay the loan, which was their deposit, when they sell. Shared owners pay a sometimes crippling part rent, part mortgage for just a percentage of their property. Right-to-buy clients mostly benefit from an automatic deposit, which has dwindled to a mere £16,000 in recent years. This is what you get whether you’ve been paying rent for three years or twenty, and it constitutes a mere fraction of a good deposit on a family home in London. There are many council tenants, qualifying for the right-to-buy, who still cannot find a footing on the property ladder, because their houses are valued too highly. Now, that’s a shame! So decide what you will. Whatever your thoughts on Abbey and the Continentals, there is something that cuts across all boundaries, cultures, races, means, ages and abilities; if nothing else, we all have dreams. And, even today, for some, having a home is sadly one of those dreams. So the only outright truth here is that we are all entitled to a home. Whether you rent it or buy it merely depends on your personal dreams; whichever choice will open the doors that will make them a reality. Lawna Elayn Tapper is a writer with Ricenpeas, an award-winning independent film production company.